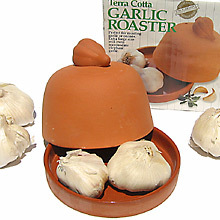 Terra Cotta Garlic Roaster is made out of ceramic and is perfect for roasting garlic or onions. The lid features ventilation holes and a decorative garlic handle on top. The interior is glazed for quick and easy clean up. Use this great roaster and enjoy the smell of roasted garlic in your whole kitchen. Net wt. 1 lb. Ship wt. 3 lb.